The Spanish architect Rafael Moneo has been bestowed with the 2012 Prince of Asturias Award for the Arts, as made public today in Oviedo by the Jury responsible for conferring said Award. The Jury for the Award –convened by the Prince of Asturias Foundation– was chaired by José Lladó y Fernández-Urrutia and composed of Charles Fitz-James Stuart Martínez de Irujo, Duke of Huéscar, José Luis Garci Muñoz, Guillermo García-Alcalde Fernández, Enrique González Macho, Emilio Marcos Vallaure, Hans Meinke Paege, Benigno Pendás García, Benedetta Tagliabue, Amelia Valcárcel Bernaldo de Quirós, Benjamin Weil, Miguel Zugaza Miranda and José Antonio Caicoya Cores (acting as secretary). 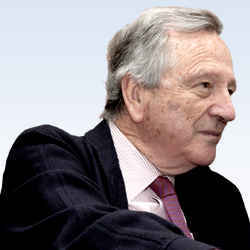 Considered one of the leading avant-garde architects, Rafael Moneo was born in Tudela, Navarra, in 1937. He graduated from the Higher Technical School of Architecture of Madrid in 1961, working during his student years with Francisco Javier Sáenz de Oiza, 1993 Prince of Asturias Laureate for the Arts, and the Danish architect Jorn Utzon. He lectured at the Higher Technical Schools of Architecture of Madrid and Barcelona, combining architectural design with teaching. He worked in New York from 1976 on, at the Institute of Architecture and Urban Studies, while also teaching at the Cooper Union School of Architecture. He likewise lectured at the École Polytechnique Fédérale in Lausanne (Switzerland) and at the American universities of Princeton and Harvard. He was Dean of the Graduate School of Design at Harvard University between 1985 and 1990, where he currently lectures in addition to being the first Josep Lluis Sert Professor in Architecture. the New Museum of the Roman Theatre of Cartagena (2008). His international projects include, among others, the Davis Art Museum at Wellesley College in Massachusetts (1993), the Museum of Modern Art and Architecture in Stockholm (1998), the hotel and office building in Potsdamer Platz in Berlin (1993-1998), the Cathedral of Our Lady in Los Angeles (USA, 1996), the Library of the University of Louvain (Belgium, 1998), the expansion of the Museum of Fine Arts, Houston (2000), the official residence of the Spanish Ambassador in Washington (2004) and the Chace Center, a building forming part of the Rhode Island School of Design (USA, 2008). In 2010, he published Apuntes sobre 21 obras (Notes on 21 works), which includes a selection of his work over the past four decades. His latest projects include the design of the future Museum of the University of Navarra. He has won the most prestigious international awards in architecture, such as the Arnold W. Brunner Memorial Prize (1993) from the American Academy of Arts and Letters, the Schock Prize in Visual Arts (1993) awarded in Stockholm, the Pritzker Prize (1996), the Antonio Feltrinelli Prize (1998) awarded by the Accademia dei Lincei in Rome and the Mies van der Rohe Award (2001) conferred in Barcelona. He holds gold medals from the Spanish Academy of Fine Arts (1992), the France Academy of Architecture (1996), the International Union of Architects (1996), the Royal Institute of British Architects (2003) and the Higher Council of Architects’ Colleges of Spain (2006). Holder of honorary doctorates from the University of Louvain, the École Polytechnique Fédérale in Lausanne and the University of Navarra, he is a member of the Spanish Royal Academy of Fine Arts of San Fernando, the American Academy of Arts and Sciences, the Academy of Saint Luke in Rome and the Swedish Academy of Fine Arts. This year a total of 39 candidatures from Argentina, Brazil, Canada, Colombia, Cuba, Egypt, Estonia, France, Germany, Ireland, Israel, Italy, Japan, Lithuania, Mexico, Panama, Paraguay, Poland, Portugal, Rumania, Sweeden, Turkey, United Kingdom, United States and Spain ran for the award. This is the first of eight Prince of Asturias Awards, which are being bestowed this year for the thirty-second time. The rest of awards will be announced in the coming weeks in the following order: Social Sciences, Communication and Humanities, Technical and Scientific Research, Letters and International Cooperation, with the Sports and Concord awards being announced in September.